What's good spiked? Drinks, volleyballs, and, if you ask us, necklaces. Grab this one for $10 less with the code NECKANDNECK. There's something both fierce and dainty about this sucker. 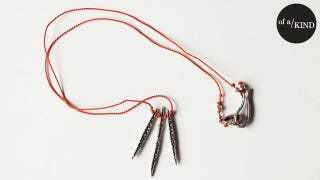 Maybe it's how the oxidized silver plays off the slim, coral silk cord? Maybe it's the way it falls just past your collarbone? It's handmade in Oakland, California, by Lauren Wolf—who's basically the coolest ever. She has a rad shop called Esqueleto in Temescal Alley, this pedestrian-only part of town that's just asking to be explored (more on that here). Whatcha waiting for? Land this necklace for $115 with the code NECKANDNECK. And, you can use that same NECKANDNECK code for $10 off anything you want to buy from Of a Kind—now until February 21.